The big move was scheduled to begin at 12:01 a.m. Saturday and take 13 to 18 hours to squeeze down 16½ miles of streets, avenues and boulevards from Marina del Rey on the coast to the center in Exposition Park near downtown. The tank's trek was expected to be not quite as difficult as when the 122-foot-long Endeavour, with a wingspan of 78 feet, was similarly hauled 12 miles to the center from Los Angeles International Airport. Extensive preparations included removal of trees, street posts and other obstacles but that journey took about 17 hours longer than planned. It nonetheless became a spectacle enjoyed by big crowds along the way. 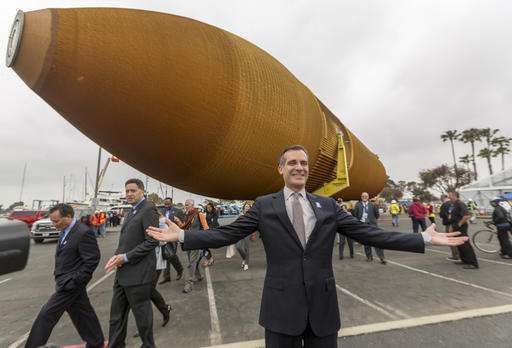 Although longer—154 feet—the 65,000-pound external tank is much narrower than the shuttle with a diameter of 27.5 feet. The giant orange tank was shipped to California by barge from a NASA facility in Louisiana. The tank traveled through the Panama Canal to the Pacific and arrived Wednesday at Marina del Rey, a yacht harbor on the Los Angeles County coast where it was offloaded to await the weekend move. Known as ET-94, it was NASA's last flight-qualified external tank but was never used before the shuttle program came to an end. External tanks not only carried propellant for space shuttles' main engines but were the backbone of the launch system. An orbiter and two solid rocket boosters would be attached to the tank for the fiery ascent into space. The tank's surface is covered with a layer of foam to keep the propellants at the proper temperature, reduce the formation of ice and to provide protection from heat as it sped through the atmosphere. ET-94 was built for use by the shuttle Columbia, which disintegrated over Texas as it was returning from a mission. The investigation found that foam fell off that mission's external tank during launch and punched a hole into a wing, allowing hot gases of the fiery re-entry inside the structure. Investigators used many pieces of foam from ET-94 in tests to come to the conclusion.